NOTE: Veteran blogger Tim Parish — a.k.a. 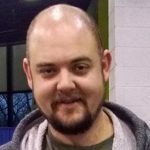 “The Real DFG” is now sharing his wit and sarcasm as a writer for Puck Junk. Please welcome him in the comments below. It’s that time of year again, ladies and gentleman. Yes, the hockey season is upon us. With training camps about done, I figured it is a fine time to break the first box of the year. 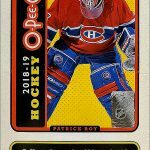 Like every year, for the last 20, Upper Deck rung the bell to start the season in early August with their 2018-19 MVP product. 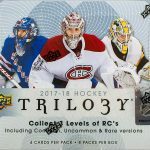 Upper Deck has built MVP’s reputation as a lower-priced product that offers collectors a chance at affordable cards that feature a myriad of today’s stars, with an opportunity at some of the rookies that debuted at the end of last season. The base cards are sequentially numbered 1-200, which makes it a fairly easy set to put together with about 130 cards, without duplicates, coming out of one hobby box. 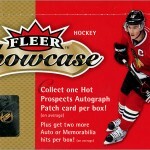 The base cards feature an action photo of the player with the typical Upper Deck logo in the top corner. 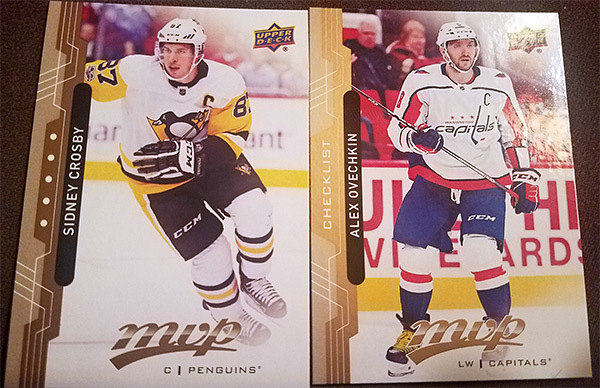 The MVP logo adorns the bottom of the card along with the player position and team. The left side of the base cards has a two-tone gold strip running from top to bottom that features what looks kind of like a circuit board-type pattern. In the center, there are five white dots and the player name is featured in white lettering in a black bubble, centered on the photo. Honestly, these remind me of the 2009-10 Fleer Ultra set design. The backs are, well, kind of boring for a few reasons. First, there is no player photo. Second, the bulk of the design is a larger version of the gold, circuit board striping with the player name just like the front, but across the top this time. To be honest, at this point, the gold is just too much. 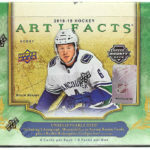 There is the team logo close to the center, followed by the player vitals, all necessary components of any trading card. But finally, the backs feature a grouping of stats that range from one season up to six. If the player is much more of a seasoned veteran, you’ll have to look elsewhere for the rest of their stats. For the fourth season in the MVP family of cards, there are high numbered base cards that feature some of today’s superstar players (numbers 201-220). The difference between these and the first 200 base cards is that the two-tone gold stripe features a different shade of gold. The outer portion is a bit lighter than on the main base cards. 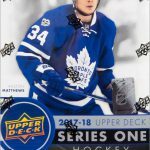 The rest of the base cards (numbers 221-250) feature the first crop of rookies for the upcoming 2018-19 season. These cards are designed just like the others only the gold colored stripe is much darker, even a bronze-y color, and displays “ROOKIE” in place of the five white dots. All high numbered cards fall about 1:2 hobby packs. I received exactly that…10. 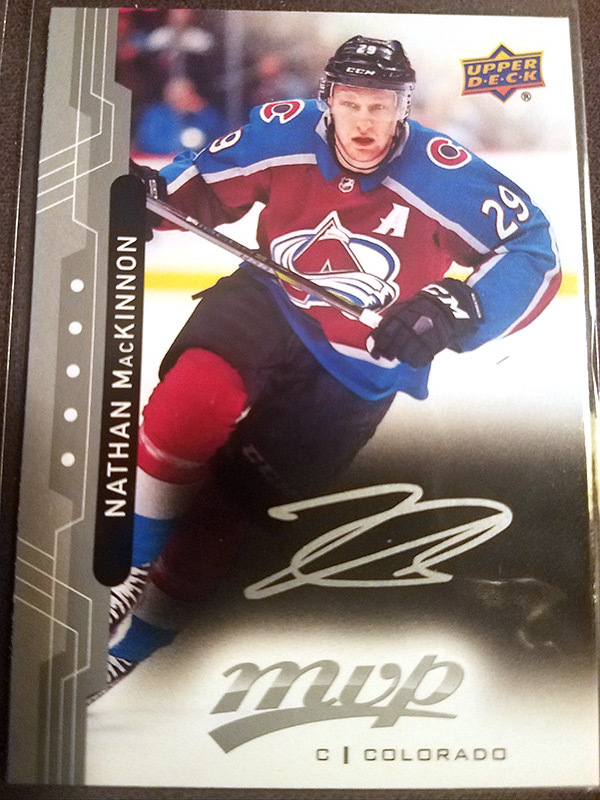 Once again, MVP has brought back the Silver Script parallels, which features the same card design as the base but with silver instead of gold striping and a silver facsimile autograph of the featured player. These fall about six per box. In past years, the silver script was actually stamped in silver foil, making it a little more alluring. This year, the silver ink is actually flat. 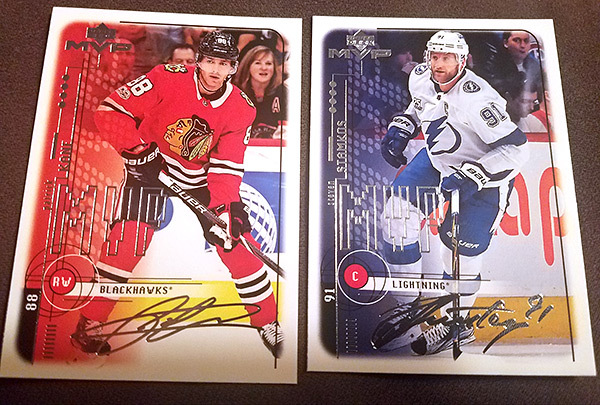 In addition to the Silver Scripts, there are also Super Scripts, which are serial numbered out of #/25, with both Black Script versons #/5 and Gold Script versions #/150 but these are only found in retail Blaster Boxes. 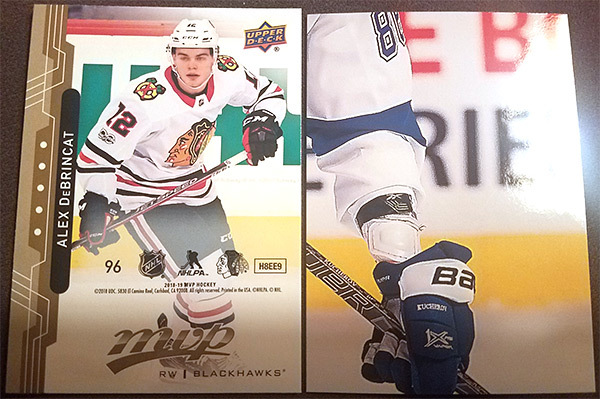 The Puzzle Back parallels are back as well which can vary from five or six in every hobby box (I got only five). These feature a player on the front (or is it the back?) with the set number and typical “copyright” data you find on the bottoms of normal cards. However, the backs feature a part of a nine-piece puzzle that forms to make a large version of a player card. There are 200 cards total in the Puzzle Back set, which I’m guessing means there are two checklists without puzzle pieces. 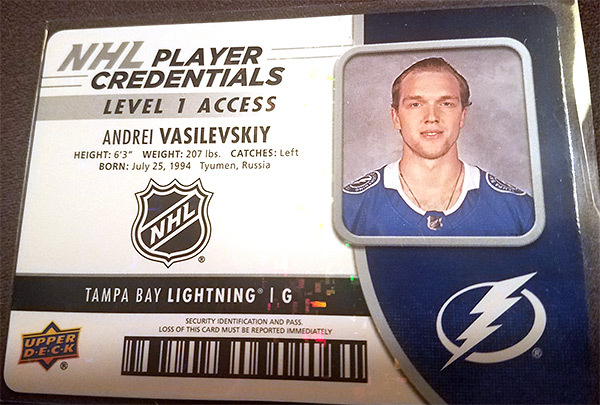 Player credential cards are back again (much to my dismay). These are about 1:6 in hobby packs which come out to about three per box. I received the three I was promised. These cards look like player ID badges that could be issued by the team so they can get in and out of the secured areas of the arena. The basic player can get into LEVEL 1 areas, while some vets have the VIP ACCESS. Rookies also have the ENTRY LEVEL access. Oh, there are auto versions of those, too. I didn’t get one but they are a case hit. 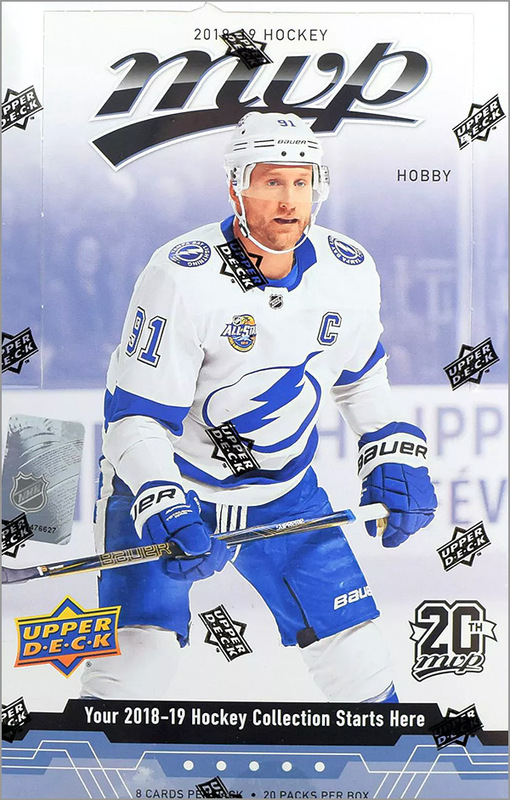 As I mentioned earlier, this is Upper Deck’s 20th Anniversary of the MVP product and to celebrate, they have included inserts that feature 1998-99 MVP design. First, the 100 player Silver Script parallels are thrown in feature today’s players on yesterday’s design. According to Upper Deck, these fall about 1:5 packs in the hobby boxes, which comes out to about four per box, which I received exactly that. 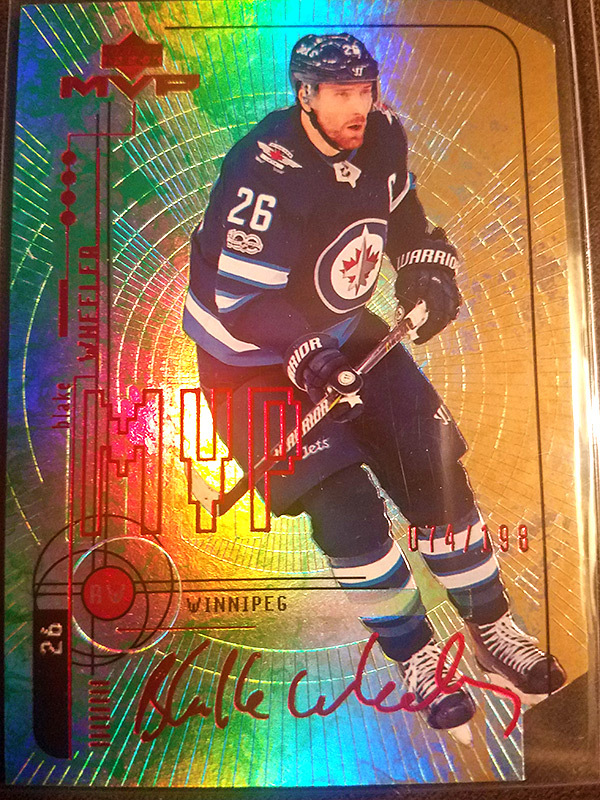 There is also a Colors and Contours die-cut set again, only this year it also utilizes the 1998-99 design, using the latest Spectrum FX printing technology to give the card some flash. There are base cards as well as serial numbered Gold (#/198) and Purple (#/8) parallels of these. 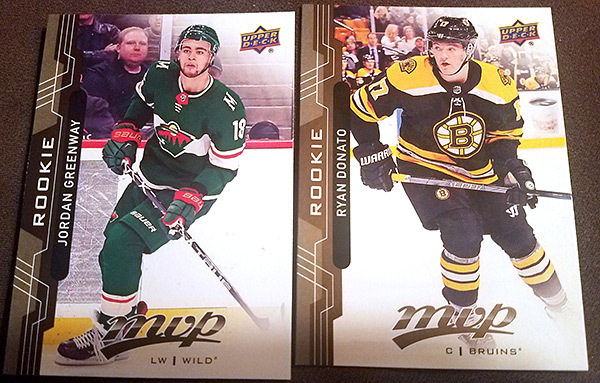 To liven things up a bit, Upper Deck bought back a bunch of their 1998-99 sets to be reinserted into hobby packs. Yes, the entire 220 card set has been stamped with a special gold foil 20th anniversary emblem and serial numbered #/20 to celebrate the inaugural edition. I received one of these and it was a bit of a disappointment. 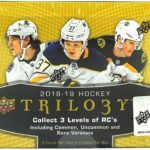 Finally, there is a chance, albeit a long one, to get a division rookie redemption card which is good for a set of rookies from each team in each division. 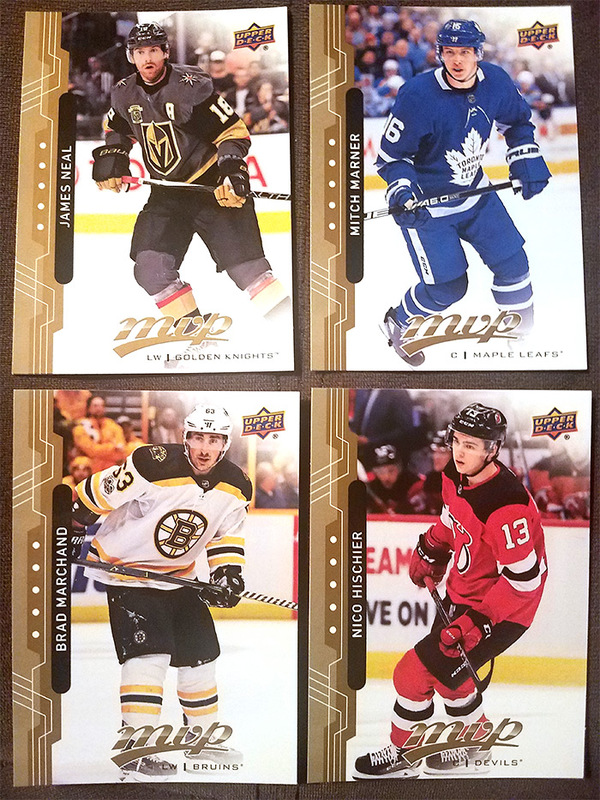 Upper Deck featured these last year as well and I was lucky enough to pull the Metropolitan Division one (still haven’t received the cards but that’s another story). This time around, no such luck. These fall about one per case on average, and I have read on some of the forums that there have been cases opened featuring none. So take that for what it’s worth. 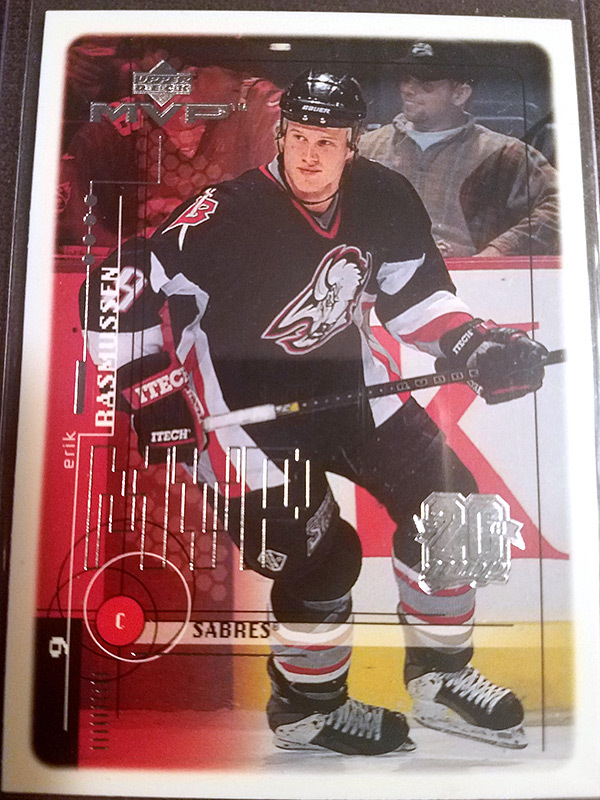 Looking back on the 1998-99 set checklist, there is a much larger chance at the duds rather than the studs. But I suppose any tough pull is better than none. 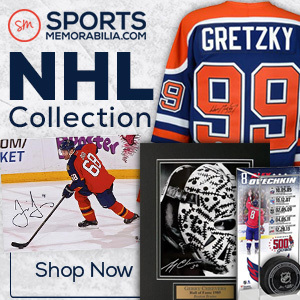 It looks on the secondary market, the real prizes here would be the Hasek, Gretzky, Jagr, Koivu, Selanne, or Yzerman. But just like most products, prices will cool off after the newness has worn off.